Verdict – Nat Sherman Bench series is worth exploring. Unfortunately you will need to stop by the NYC store on 42nd to get these for now. 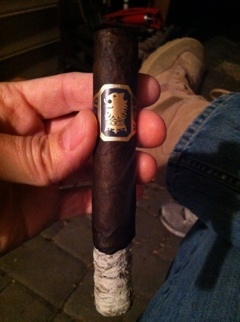 Next up is the Liga Privada offering called the Undercrown. This was developed after the rollers were asked to stop smoking their favorite Liga cigars due to supply concerns. The senior rollers then altered the blend and substituted some leafs that were in larger supply. The result was a product that caught the attention of ownership and ended up being a regular product. A true product of the rollers, not the usual product development crew. I really enjoyed this cigar! It was sitting in my humidor for about a month when I smoked it. The dark San Andres maduro wrapper fools you into thinking it will be a powerful cigar. It is actually a medium smoke with very smooth delivery. I could smoke this cigar every day and you might want to try this one out for a “go-to” cigar if you liked balanced, medium cigars. 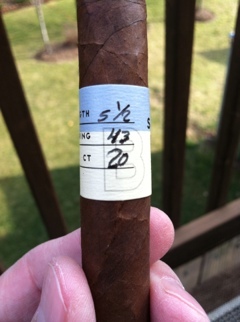 I smoked the Belicoso which cost around $8.From what I understand, it is all Nicaraguan. Verdict – Like it, will buy again. And now for a kick! 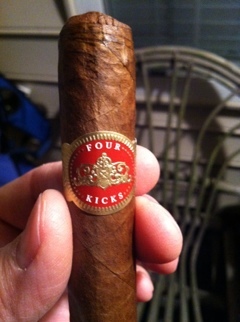 Four to be exact, the Four Kicks from Crowned Heads is a Dominican Republic cigar with Nicaraguan and Ecuador tobaccos that delivers a smooth, balanced tasting cigar at full strength. This to me is a unique blend and it offers the cigar smoker who wants the full strength but would perhaps like something more refined or balanced in flavor. I typically like more flavors than this cigar was giving me, but that doesn’t mean this isn’t going to please you. 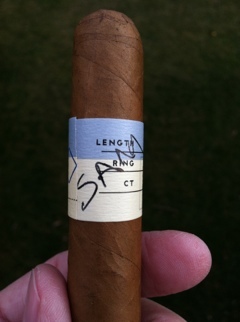 Verdict – I wouldn’t hesitate to smoke this one and will buy again. 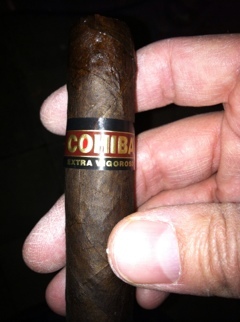 So this Cohiba extra vigoroso showed up in a monthly shipment that I belong to. The write-up on it promised quite a bit in flavor and I was excited for a full strength cigar with sungrown top leafs from the tobacco plant. The top leafs of the tobacco plant tend to have more flavor due to the chemical reaction received from nutrients travelling up top. There are actually two different leafs blended that are top leafs (they are in the filler) and then they are mixed with a Connecticut binder. So, you can read up on this one if you search for it. This is NOT a cheap cigar, goes for around $12. Verdict – Pass. Seriously. There are better cigars at cheaper prices. If you want to impress however, have at it. They look nice and the name recognition is undeniable (even though they are not real Cubans). 1968 was a great year. Not that I remember, but I spent nine months of it developing into a bundle of joy. Though my dad probably did not smoke a cigar, he was a Camel (non-filtered) smoker for most of his life, I can’t help but think of how many dads have smoked a Macanudo cigar in America to celebrate their newborn. To me, Macanudo is the archetype golf cigar. Maybe one smoked after a merger or opening of a new Casino. 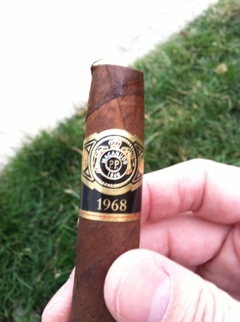 This 1968 offering has a beautiful San Agustin wrapper and the leafs picked are all aged and smoke smoothly. This is as strong as a Macanudo gets. The cigar was good, but it’s really not my type. Verdict – buy to impress or to please almost anyone.